The Debus VW T4/T5/T6 Sun Canopy awning in Anthracite Grey takes just 6 minutes to connect to a Transporter to create 8 square metres of sun shade and rain shelter over the side door. This VW camper canopy has standard 6mm core Kador beading sewn into the rear edge that simply slides directly into C-Channel awning rails and Reimo Multi-Rails. The canopy also has a pole sleeve sewn in for connection to earlier Buses with roof gutters via a Pole & Clamp Drive-Away Kit. Check out our blog page for more info on canopy connections and tips on setting-up. This waterproof, lightweight canopy is packed full of features and can be set up in numerous configurations using the height adjustable poles… use just one middle pole in wet conditions to allow complete water run-off. It can also be set up as a free standing shelter or attached to a Vango Kela or Idris Awning as a retrofit front canopy. The compact pack size makes this versatile canopy easy to store under a Rock’n’Roll bed when not in use. 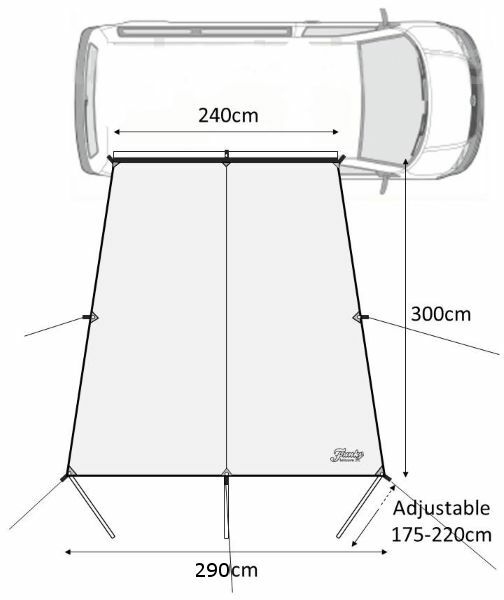 Includes: Canopy with 5 x pre-attached guylines, 3 x sprung-sectioned galvanised silver steel poles, 8 x steel rock pegs, 3 x vehicle edge guylines and zipped bag with carry handles and sewn-in instructions.